Digital Guardians - Installation Cyber Security - USA Patriotism! Due to technology’s exponential growth, access to powerful computers and dynamic software has become increasingly easier for a wide margin of people to obtain. As a result of sensitive information being distributed digitally, cyber attacks have become more prevalent as technology progresses. These attacks can wreak havoc on mediums ranging from personal cell phones to complex government networks. Much like how private organizations offer services that provide protection from these attacks to civilians, the U.S. Air Force has its own team of professionals that ensure its virtual assets and information are protected: cyber security technicians. Installation cyber security offices are tasked with safeguarding two key Air Force assets that, in the wrong hands, could lead to major operational security leaks: information assurance and communications security. “When it comes to information security, we monitor the Non-secure Internet Protocol Router Network and the Secret Internet Protocol Router Network enclaves throughout the base,” said Master Sgt. Daniel Elliot, 355th Fighter Wing cyber security COMSEC account manager. If someone sends information out through NIPRNet that could be a leak of operational security, cyber security is contacted as soon as possible. From there, we quarantine the problem by finding the workstations involved in the incident and restricting their network access until the issue can be resolved, explained Senior Airman Jason Crutchfield, 355th CS cyber security technician. Though software issues can be a large concern, cyber security personnel must also make sure certain hardware is disposed of safely and securely. “We make sure that we properly destroy things, like hard drives, in order to eliminate the risk of any possible info leaks,” said Airman 1st Class Damacius Williams, 355th CS cyber security technician. 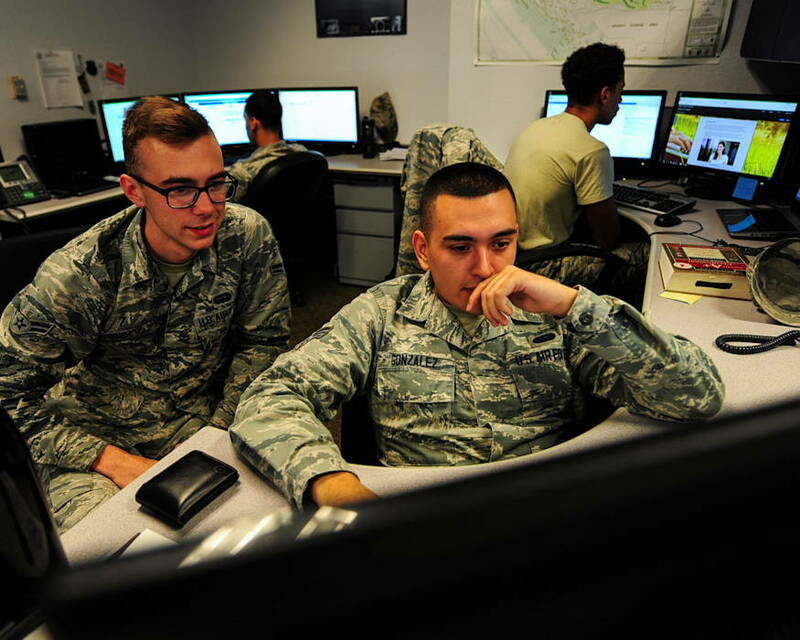 While these duties ensure the safety of the Air Force’s digital and physical information, they are a small component of the overall job of cyber security technicians. About 50 percent of their workload actually consists of COMSEC. Within the realm of COMSEC, cyber security technicians manage, generate and issue encryption keys used to secure network data and connections. These encryptions can be used to safeguard networks ranging from phone lines to communication equipment used for exercises and deployments. In addition to protecting Air Force networks and systems, cyber security personnel also educate and train installation personnel on securing sensitive information. Thanks to cyber security technicians, the Air Force’s digital assets are better protected and Airmen have a greater understanding of how to secure sensitive data.